Watch live and recorded webcasts and videos featuring Aberdeen portfolio managers and industry experts. Get a first-hand glimpse into Aberdeen's investment process and updates on Aberdeen's market outlooks and regional commentaries. Head of Global Equities, Stephen Docherty, discusses the effects of the Federal Reserve’s tapering program on markets and talks about where he and the team are finding value. Aberdeen's Hugh Young gives an update on the Asia-Pacific region and discusses why Aberdeen believes the positive outlook for Asia is still intact. Devan Kaloo, Aberdeen's Head of Global Emerging Markets, speaks to the recent slowdown in emerging market equities and explains why he believes the asset class offers value in the long run. Aberdeen fund managers give their outlook on emerging markets for 2014. Aberdeen Fund Managers speak about the possible effects that tapering could have on global markets in 2014. Aberdeen fixed income portfolio managers speak to the trends that are affecting the markets in both the US and globally and give some color to the reasons why they believe the future is bright for certain fixed income asset classes. Learn about some of the reasons why Aberdeen finds Emerging Market Debt such an attractive asset class, and why Aberdeen believes it has the resources and expertise to take advantage of the potential opportunities Emerging Market Debt has to offer. Aberdeen has had quite a busy 2013. In this highlights film, see some of Aberdeen's various global events and sponsorships that have made 2013 as exciting as ever. 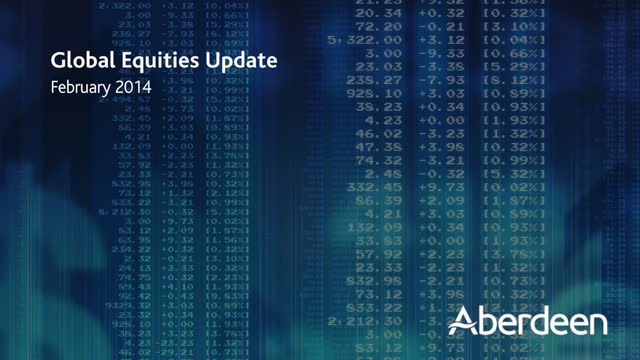 In this video, get a glipmse into Aberdeen's global fixed income capabilites. Hear Aberdeen fixed income fund managers speak about the global trends that are affecting the fixed income space today and about Aberdeen's unique approach to investing in fixed income globally. Hugh Young, Aberdeen's Head of Equities, speaks to the current trends that are affecting the Asian region.